I had no idea this place even existed, yet here it stood on a quiet back street in the shadows of downtown, hard beside the railroad tracks. The "Closed" sign in the window on an otherwise perfect sunny summer's afternoon meant I wouldn't be eating here today, but the neighbourhood isn't far from home, so I made a mental note to return another day and give it a try. I'm not sure when the national and global chain restaurants started to push mom-and-pop-style operations like this one into history, but I'm pretty sure we're close to the point where places like this slowly cease to exist amid a sustained assault of homogenized, hyper-marketed chain outlets staffed by people whose names no one ever remembers. 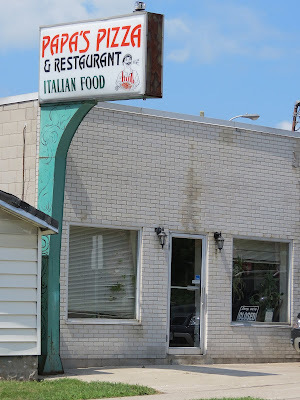 Although I'm hardly the target customer for a homegrown pizza joint, simply knowing places like this are around has always brought me a certain degree of comfort. Because a place like Papa's exists only here - let's repeat that, shall we? Only Here - and it's what makes London different from, say, Stratford or Kitchener or Toronto. But this isn't about cheerleading my own city. It's about cheerleading every city, and recognizing what we all lose when neighbourhoods are rebuilt according to a global business template that plops the same rotation of businesses in the same-looking strip malls, big box power corners and major malls that have rapidly removed sense of place from the places we once called home. Knowing that those other cities also have their own locally-flavoured restaurants (and corner stores, and related owner-operated, well-established, non-franchised businesses) brings me comfort, as well, because it reinforces that every city, and not just my own, remains unique in its own way, with businesses grounded to the communities that they serve in ways no franchise operation could ever approach. I'm glad I happened across this place on this particular day, and I look forward to returning on a day when they're open for business. 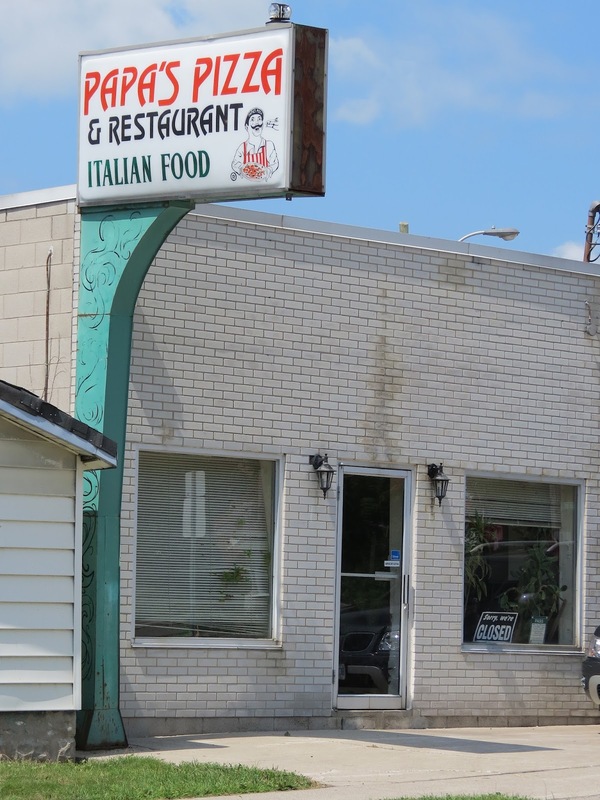 Because if we lose places like Papa's Pizza & Restaurant, we lose far more than another place to get a slice of cheesy pie. Your turn: What's your favourite local business?